Housing schemes in Pakistan have attracted many peoples towards its luxurious and comfortable life style. Nowadays in Pakistan you will see some biggest names of housing schemes advertising there offers in newspapers, TV, radio etc.These fenced housing authorities have some luxurious houses with 24/7 electricity supply, parks, stadium, university, hospital, shopping centres and groceries in each sector of the phase.These housing schemes have great security systems and anti theft system for homes, you cannot enter to these housing authorities until your relatives identify you or provide your complete bio data to the security officers on security gate. Defence housing authority is the oldest and the most expensive housing scheme in Pakistan. Living in DHA is great experience because you don't face any problem regarding to the security of your family in the current situation of Pakistan. DHA offers medical centre in the supervision of best doctors and medical staff with 24 hours emergency – they also provide 24/7 ambulance service. DHA have the most popular educational systems – your children's will get education from primary level to graduation in DHA educational system in the supervision of highly educated and experienced teachers and staff. DHA provides different safety systems to their respected customers e.g, police station etc. On weekends you can have fun in DHA parks or cinemas.If a resident of DHA dies they provide free space for the funeral of dead person in DHA graveyard. The best thing in DHA is Pak Army is monitoring and administrating all DHA programs in Pakistan. Bahria town is most popular housing scheme in Pakistan because Bahria housing scheme is providing the most unique and totally new facilities to the customers like zoo, golf club etc. that make Bahria the largest housing scheme in the asia. Buying house or commercial property can avail you amazing facilities like banks 24/7 electricity supply , water supply and Bahria loans. 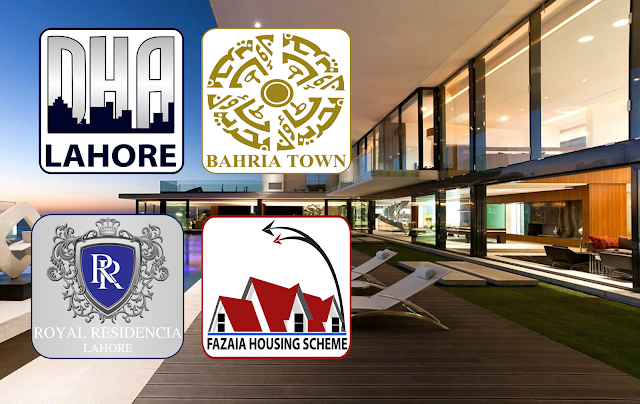 Bahria housing scheme provides you leasing the house or property or you can easily finance a house or commercial plot in bahria housing scheme with easy installments. Bahria town is providing schools and colleges and medical complex and all kind of other lifestyle facilities. Bahria town recently took a step up in the leaderboard of mosques with the 7th largest mosque in the world. Bahria housing scheme is the first scheme that built houses of egyptian styles called bahria Ihram-e-misr. Royal Residencia is not royal by its name it is royal because of its work - they have introduced a new way of housing instead of old housing strategies. Royal Residencia is not big as Bahria or DHA but it has all luxurious facilities in it e.g, more advanced and fast security systems, mini golf course, community centre, Hospital, Fitness clubs, mosque, schools system and parks.All the houses are fully luxurious with opening to a wide road in front of all the houses and parking extension in front of each house , hospital, golf course etc. Royal Residencia community is not that large but all people are well educated and courteous. Royal Residencia has a well known schools system for community people. Royal Residencia consists of 5 blocks and every block is designed differently and each block has same sized houses or apartments. As we can understand from the name fazaia housing scheme was introduced and built in the supervision of Pakistan Air Force ( Pak Fazaia ). Fazaia Housing Scheme is currently under construction more than 600 houses have been built in all phases of Fazaia Housing Schem. Because Fazaia Housing Scheme is new - there are not more facilities than all other housing schemes. Fazaia Housing Scheme don't have much luxurious life style facilities but it is way more better than living in rural areas of Pakistan.Security systems in Fazaia Housing Scheme are very strong because it is getting monitored in the supervision of troops. Askari Housing Scheme is the 5th largest housing scheme in Pakistan. This housing scheme was introduced specially for retired army troops and government workers.Askari Housing Scheme is the most secured housing scheme in pakistan because army has the security responsibilities of Askari Housing Scheme so, risk free life is guaranteed with all life style facilities.